Keywords: Surgical site infection (SSI); sepsis; healthcare associated infections (HAIs); wound care; infection control. Surgical site infections (SSIs) are a real risk associated with any surgical procedure and represent a significant burden in terms of patient morbidity and mortality, and cost to health services around the world. A multitude of risk factors influence the development of SSIs and awareness of these will help to promote effective preventive strategies. Assessment tools such as the Centers for Disease Control definitions, ASEPSIS and the Southampton Wound Assessment Scale are needed to accurately identify and classify SSIs. Infection has always been a feature of human life and sepsis in modern surgery continues to be a significant problem for healthcare practitioners across the globe. This paper describes the factors that influence surgical wound healing and the risk of surgical site infection. Until the middle of the 19th century, when Ignaz Semmelweis and Joseph Lister became the pioneers of infection control by introducing antiseptic surgery, most wounds became infected. In cases of deep or extensive infection this resulted in a mortality rate of 70-80% . Since then a number of significant developments, particularly in the field of microbiology, have made surgery safer. However, the overall incidence of healthcare associated infections (HAIs) remains high and represents a substantial burden of disease. In 1992, the US Centers for Disease Control (CDC) revised its definition of 'wound infection', creating the definition 'surgical site infection' (SSI)  to prevent confusion between the infection of a surgical incision and the infection of a traumatic wound. Most SSIs are superficial, but even so they contribute greatly to the morbidity and mortality associated with surgery  . Estimating the cost of SSIs has proved to be difficult but many studies agree that additional bed occupancy is the most significant factor. A review of the incidence and economic burden of SSIs in Europe estimated that the mean length of extended stay attributable to SSIs was 9.8 days, at an average cost per day of €325 . Surgical wounds may heal by primary intention, delayed primary intention or by secondary intention. Most heal by primary intention, where the wound edges are brought together (apposed) and then held in place by mechanical means (adhesive strips, staples or sutures), allowing the wound time to heal and develop enough strength to withstand stress without support. The goal of surgery is to achieve healing by such means with minimal oedema, no serous discharge or infection, without separation of the wound edges and with minimal scar formation. On occasion, surgical incisions are allowed to heal by delayed primary intention where non-viable tissue is removed and the wound is initially left open. Wound edges are brought together at about 4-6 days, before granulation tissue is visible . This method is often used after traumatic injury or dirty surgery. Healing by secondary intention happens when the wound is left open, because of the presence of infection, excessive trauma or skin loss, and the wound edges come together naturally by means of granulation and contraction . Experimentally as well as clinically it has been shown that a delay in wound closure of four to five days increases the tensile strength of the wound as well as resistance to infection. The overall rate of SSIs in traumatic war wounds using delayed principles was 3-4%, compared with more than 20% after primary closure . In civilian practice, delayed healing has been used successfully in cases of severe incisional abscesses, mainly after laparotomy. Another benefit of delayed closure is the cosmetic result after healing. The appearance of a wound after a delay of four to five days is comparable to that of primary closure. A wider scar follows late closure (after 10-14 days), although this is cosmetically much better than the result obtained after the healing of an open granulating wound. 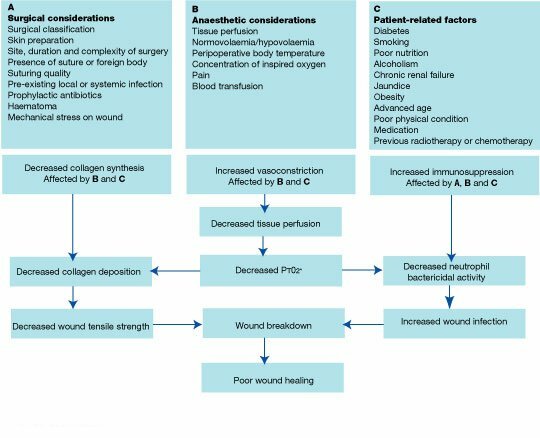 Many factors influence surgical wound healing and determine the potential for, and the incidence of, infection  [Figure 1]. The level of bacterial burden is the most significant risk factor   , but modern surgical techniques and the use of prophylactic antibiotics have reduced this risk. A system of classification for operative wounds that is based on the degree of microbial contamination was developed by the US National Research Council group in 1964 . Four wound classes with an increasing risk of SSIs were described: clean, clean-contaminated, contaminated and dirty [Table 1]. The simplicity of this system of classification has resulted in it being widely used to predict the rate of infection after surgery. Clean Elective, not emergency, non-traumatic, primarily closed; no acute inflammation; no break in technique; respiratory, gastrointestinal, biliary and genitourinary tracts not entered. Urgent or emergency case that is otherwise clean; elective opening of respiratory, gastrointestinal, biliary or genitourinary tract with minimal spillage (e.g. appendectomy) not encountering infected urine or bile; minor technique break. Contaminated Non-purulent inflammation; gross spillage from gastrointestinal tract; entry into biliary or genitourinary tract in the presence of infected bile or urine; major break in technique; penetrating trauma <4 hours old; chronic open wounds to be grafted or covered. Dirty Purulent inflammation (e.g. abscess); preoperative perforation of respiratory, gastrointestinal, biliary or genitourinary tract; penetrating trauma >4 hours old. The surgical technique used can affect the infection rate in various ways, for example in relation to skin preparation, shaving and wound closure. Skin preparation: The skin is colonised by various types of bacteria, but up to 50% of these are Staphylococcus aureus . In analyses of contamination rates after cholecystectomy, the main source of wound contamination was found to be the skin of the patient . For this reason, preoperative preparation should be performed. Evidence has shown that the use of a preoperative wash containing chlorhexidine decreases the bacterial count on skin by 80-90%, resulting in a decrease in preoperative wound contamination . The effect on SSI incidence has, however, been more difficult to demonstrate and it is possible that prolonged washing releases organisms from deeper layers of the skin. Shaving: It is now recognised that shaving damages the skin and that the risk of infection increases with the length of time between shaving and surgery . In one study, if the patient had been shaved more than two hours before surgery the clean wound infection rate was found to be 2.3% . However, if patients had not been shaved but their body hair had been clipped the rate was 1.7%, and if they had not been shaved or clipped the rate dropped to 0.9% . If shaving is essential, it should be performed as close to the time of surgery as possible. Wound closure: The healing of closed surgical wounds depends on many factors, one of the most complex of which is the influence of technique and expertise . The incidence of SSIs in relation to the different types of closure techniques used is shown in Table 2. Note: all wounds were closed under antibiotic cover. Once wounding has occurred, the surgeon has control over several factors concerning the wound itself that may reduce susceptibility to infection. The duration of surgery is one factor that influences the wound infection rate. Procedures that take longer than two hours are associated with higher infection rates  . This may be related to desiccation or maceration of the wound edges, an increase in the number of bacteria that accumulate within the wound, and decreased temperature and hypovolaemia leading to peripheral vasoconstriction and therefore poorly perfused skin. Fewer bacteria are required to produce an infection in the presence of necrotic tissue, foreign bodies, haematomas, seromas and poor tissue perfusion. Although infection cannot occur without any bacterial burden or contamination, the presence of bacteria in a wound does not inevitably result in an infection. Many different factors determine the potential for and incidence of infection [Figure 1]. The most widely recognised definition of infection, which is used throughout the USA and Europe, is that devised by Horan and colleagues and adopted by the CDC . This splits surgical site infections into three groups - superficial and deep incisional SSIs and organ-space SSIs - depending on the site and the extent of infection. 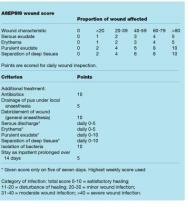 The definitions of superficial and deep infections are summarised in Table 3. The CDC definition states that only infections occurring within 30 days of surgery (or within a year in the case of implants) should be classified as SSIs. involve only the skin or subcutaneous tissue around the incision. incisional SSIs that extend into the fascial and muscle layers (see deep SSIs). involve deep soft tissues, such as the fascia and muscles. diagnosis of a deep incisional SSI by a surgeon or attending physician. Severity: a wound infection is described as minor if there is discharge without cellulitis or deep tissue destruction, and major if the discharge of pus is associated with tissue breakdown, partial or total dehiscence of the deep fascial layers of the wound, or if systemic illness is present. No validated universal system is designed specifically to aid the assessment and management of surgical wounds. The most commonly used, the CDC definition, employs stringent criteria to classify infection. 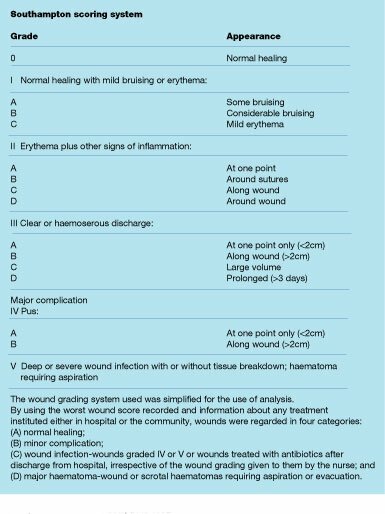 Several other wound scoring systems exist and two of the best are ASEPSIS [Figure 2] and the Southampton Wound Assessment Scale [Figure 3]. These enable surgical wound healing to be graded according to specific criteria, usually giving a numerical value, and therefore provide a more objective assessment of the wound  . The ASEPSIS system was devised to assess wounds resulting from cardiothoracic surgery, while the Southampton scale was designed for use in the postoperative assessment of hernia wounds. The Southampton system is much simpler than the ASEPSIS system, with wounds being categorised according to any complications and their extent . Both systems, however, have been developed for use following specific types of surgery and this may limit their usefulness. In spite of the use of prophylactic antibiotics, SSIs are still a real risk of surgery and represent a substantial burden of disease for both patients and healthcare services in terms of morbidity, mortality and economic cost. Changes in definition have focused attention on infection of the surgical incision, and factors associated with SSIs are now being studied with a view to limiting the risk of infection. Research has shown that surgical techniques, skin preparation and the timing and method of wound closure are significant factors that can influence the incidence of subsequent infection. Antibiotic prophylaxis has also had a positive impact after certain types of surgery. Many other factors have been identified as having an effect on the potential for infection and healthcare professionals should consider these before, during and after surgery. This article was recently reprinted in the EWMA Journal 2005; 5(2): 11-15. 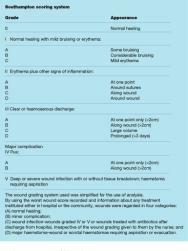 The 2005 EWMA position document on 'Identifying criteria for wound infection' is available from www.ewma.org and contains further discussion of SSI. 1. Altemeier WA. Sepsis in surgery. Presidential address. Arch Surg 1982; 117(2): 107-12. 2. Horan TC, Gaynes RP, Martone WJ, Jarvis WR, Emori TG. CDC definitions of nosocomial surgical site infections, 1992: a modification of CDC definitions of surgical wound infections. Infect Control Hosp Epidemiol 1992; 13(10): 606-8. 3. Leaper DJ, van Goor H, Reilly J, Petrosillo N, Geiss HK, Torres AJ, et al. Surgical site infection - a European perspective of incidence and economical burden. Int Wound Journal 2004; 1(4): 247-273. 4. DiPiro JT, Martindale RG, Bakst A, Vacani PF, Watson P, Miller MT. Infection in surgical patients: effects on mortality, hospitalization, and postdischarge care. Am J Health Syst Pharm 1998; 55(8): 777-81. 5. Gottrup F. Wound closure techniques. J Wound Care 1999; 8(8): 397-400. 6. Thomas S. Wound Management and Dressings. London: Pharmaceutical Press, 1990. 7. Leaper D J, Gottrup F. Surgical wounds. In: Leaper DJ, Harding KG, editors. Wounds: biology and management. Oxford: Oxford University Press, 1998; 23-40. 8. Buggy D. Can anaesthetic management influence surgical-wound healing? Lancet 2000; 356(9227): 355-7. 9. Berard F, Gandon J. Postoperative wound infections: the influence of ultraviolet irradiation of the operating room and of various other factors. Ann Surg 1964; 160(Suppl 1): 1-192. 10. 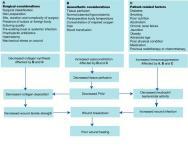 Cruse PJ, Foord R. The epidemiology of wound infection. A 10-year prospective study of 62,939 wounds. Surg Clin North Am 1980; 60(1): 27-40. 11. Cruse PJE. Classification of operations and audit of infection. In: Taylor EW, editor. Infection in Surgical Practice. Oxford: Oxford University Press, 1992; 1-7. 12. Culver DH, Horan TC, Gaynes RP, Martone WJ, Jarvis WR, Emori TG, et al. Surgical wound infection rates by wound class, operative procedure, and patient risk index. National Nosocomial Infections Surveillance System. Am J Med 1991; 91(3B): 152S-157S. 13. Ferraz EM, Bacelar TS, Aguiar JL, Ferraz AA, Pagnossin G, Batista JE. Wound infection rates in clean surgery: a potentially misleading risk classification. Infect Control Hosp Epidemiol 1992; 13(8): 457-62. 14. Eriksen NH, Espersen F, Rosdahl VT, Jensen K. Carriage of Staphylococcus aureus among 104 healthy persons during a 19-month period. Epidemiol Infect 1995; 115(1): 51-60. 15. Whyte W, Hambraeus A, Laurell G, Hoborn J. The relative importance of routes and sources of wound contamination during general surgery. I. Non-airborne. J Hosp Infect 1991; 18(2): 93-107. 16. Byrne DJ, Phillips G, Napier A, Cuschieri A. The effect of whole body disinfection on intraoperative wound contamination. J Hosp Infect 1991; 18(2): 145-8. 17. Haley RW, Culver DH, Morgan WM, White JW, Emori TG, Hooton TM. Identifying patients at high risk of surgical wound infection. A simple multivariate index of patient susceptibility and wound contamination. Am J Epidemiol 1985; 121(2): 206-15. 18. Jepsen OB, Larsen SO, Thomsen VF. Post-operative wound sepsis in general surgery. II. An assessment of factors influencing the frequency of wound sepsis. Acta Chir Scand Suppl 1969; 396: 80-90. 19. Peel ALG. Definition of infection. In: Taylor EW, editor. Infection in Surgical Practice. Oxford: Oxford University Press, 1992; 82-87. 20. Wilson AP, Treasure T, Sturridge MF, Gruneberg RN. 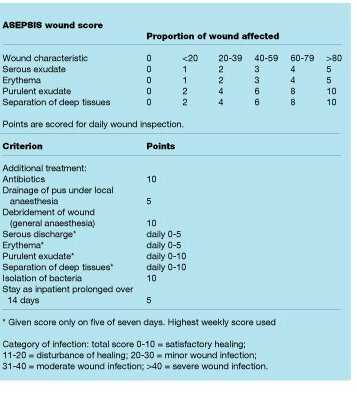 A scoring method (ASEPSIS) for postoperative wound infections for use in clinical trials of antibiotic prophylaxis. Lancet 1986; 1(8476): 311-3. 21. Bailey IS, Karran SE, Toyn K, Brough P, Ranaboldo C, Karran SJ. Community surveillance of complications after hernia surgery. BMJ 1992; 304(6825): 469-71.